APC Room Air Distribution by Schneider Electric is the most cost effective way to lower the temperature in a wiring closet by up to 40ºF (22ºC). Wiring closet heat loads are rising due to deployment of technologies such as VoIP and Power over Ethernet. 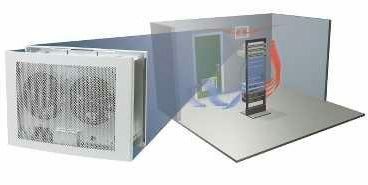 Many closets where these technologies are being deployed are not designed with adequate air distribution. The Wiring Closet Ventilation Unit is a rapidly deployable wall or ceiling mounted air distribution and heat removal system designed specifically for the wiring closet environment. By exhausting hot air from the closet to an adjacent space, it allows conditioned air (entering through the Air Intake Grill) to cool the load. This budget conscious unit is an excellent alternative to more expensive air-conditioning systems, providing reliable heat removal with the capability to lower closet temperatures by up to 40ºF (22ºC). If plugged into a UPS, it can also be used as a back-up heat removal system to an already existing air-conditioning unit to maximize system availability in the event of a power failure. Dual fans increase availability while LED status indicators and dry contact outputs enhance the unit’s manageability. Selectable fan speeds allow the user to choose between maximum performances. Architecturally neutral – Unobtrusive design and coloring, blends in with the surroundings. Hardwire capable – For installations where hard wiring is required or preferred. Easy to install – Innovative design allows for fast, easy installation by almost anybody. Multiple mounting methods – Flexible design allows for both dry wall and ceiling mount installations. Fault-tolerant fan system – In the event of a fan failure, the remaining fan(s) will continue to operate. Dry contact output – Provides remote notification of failures when used with APC environmental monitoring unit or system. LED status indicators – Quickly understand unit and power status with visual indicators. Predictive failure notification – Maximizes system availability by providing early warning of required fan or filter replacement. ACF301EM – Combined together, the Wiring Closet Ventilation Unit and the Environmental Manager provides users the ability to remotely monitor and control the cooling of their networking closet.